Spread 1 tablespoon Thousand Island Dressing over each of 6 slices bread. 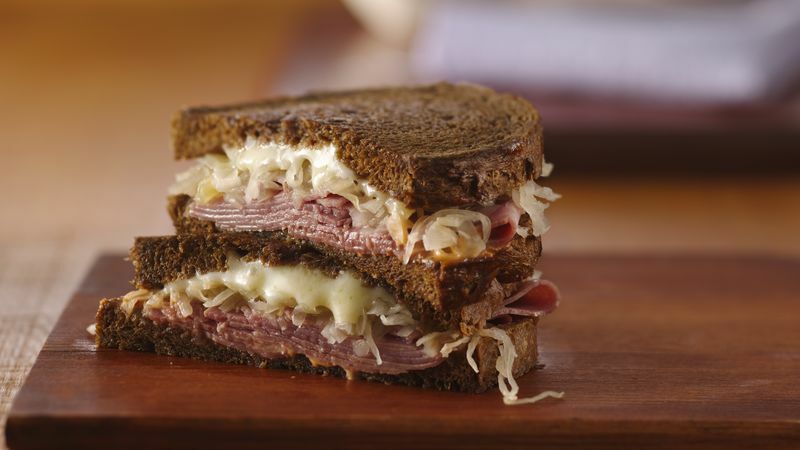 Top with cheese, sauerkraut and corned beef. Top with remaining bread slices. Spread 1 teaspoon butter over each top slice of bread. Place sandwiches, butter sides down, in skillet. Spread remaining butter over top slices of bread. Cook uncovered over low heat about 10 minutes or until bottoms are golden brown. Turn; cook about 8 minutes longer or until bottoms are golden brown and cheese is melted. For 11 grams of fat and 335 calories per serving, use purchased fat-free Thousand Island dressing; substitute thinly sliced turkey or chicken for the corned beef. Omit butter; spray skillet with cooking spray before heating. To make a Rachel sandwich, substitute thinly sliced cooked deli turkey breast for the corned beef.